MHA Group Homes are supportive living facilities licensed through the State of Kansas and accredited by the Commission on Accreditation of Rehabilitation Facilities. MHA Group Homes provide a positive personal development experience for those individuals recovering from mental illness, to help each person live successfully in the community. 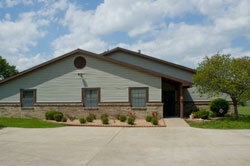 Our staff initiates personalized plans with each resident addressing their needs. The resident's need and willingness to participate in the program determine length of stay. Eligible applicants are those who have a documented severe and persistent mental illness and meet low income guidelines established by the U.S. Department of Housing and Urban Development. Applicants must meet all tenant selection criteria. You can download a housing application here .